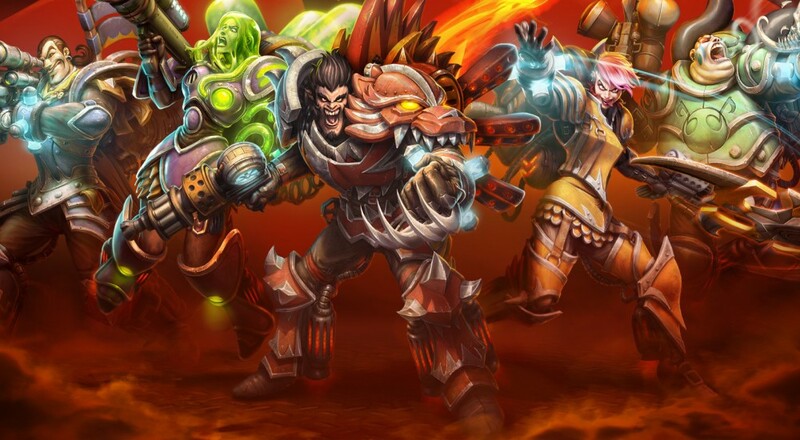 Rogue Stormers is a game that feels like the product of two different minds. One wanted a platform shooter with RPG mechanics, the other wanted a difficult shooter that was reminiscent of Contra. The result, unfortunately, is a mess of both. After a horde of orcs take over the town, it’s up to the titular heroes to fight and take it back. Across the eight campaign stages, you’ll face goblins, orcs, mechs, hot-air balloons, and a variety of other foes as you try to bring down the High Priest Hector von Garg. Along the way you’ll earn experience to unlock permanent upgrades for your hero (the only RPG mechanics that remain), boosts that last until you die (rogue-like elements), and secondary weapons for that extra burst of firepower when needed (similar to games like Contra and Metal Slug). At the end of each stage you’ll face off against either a glowing orb that you must destroy, or a boss. By completing each even-numbered stage, you’ll unlock a new hero to play, each of whom has his or her own special ability and primary weapon (ranging from a sniper rifle to a flamethrower). 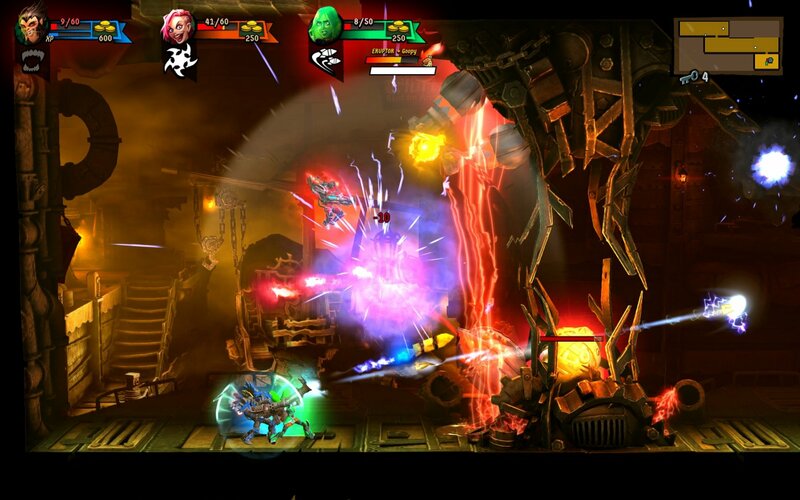 All of those mechanics are a great base for a platform shooter and my first few moments with Rogue Stormers were fun. As I approached the end of the first stage, though, there was something nagging at me about the way everything was playing out. By the start of the third level, I had a clearer picture of what that something was and by the time I got to that same level for the fourth time, I pinpointed where it had gone wrong. Rogue Stormers is difficult, but it only knows one way to challenge you and it keeps playing that tune to death. Most enemies in the game require at least two hits to kill and the bigger/tougher ones, which become more frequent as you progress, require at least a few seconds of uninterrupted fire to bring down. While your hero does have a health bar of his or her own that allows you to take at least a few hits before dying, you don’t want to waste all of that life (or health) trying to kill just one enemy. When faced with a large group of foes, therefore, you start analyzing the best way to take them all down before they do the same to you. Maybe you’ll use your dash move to dodge incoming enemy fire while slowly picking off enemies one at a time, or maybe you’ll take advantage of your secondary weapon and just start blasting everything. It’s a fun and challenging couple of minutes... the first time it happens. When that scenario repeats itself for the fifth, tenth, and hundredth time, however, it becomes tedious and frustrating. Adding to that frustration is the notion that it never really feels like you’re achieving anything by killing all of those orcs and goblins. As I mentioned earlier, there are some RPG and rogue-like mechanics at in Rogue Stormers. Enemies have a chance to drop experience or gold when they die. The experience is put towards a cumulative total for that particular character and every time a certain threshold is reached, they’ll “level up” and you will be presented with choosing one of two random upgrades for that character. You can only choose that upgrade, however, upon your next death so they don’t kick in until your next playthrough. These upgrades also only apply to that particular character, so when you’ll have to go through the whole process again when you manage to unlock a new one that you want to play.